Senior guard Mei-Lyn Bautista looks to make a shot during a game against Maryland earlier this month. When: Tuesday, Nov. 27 at 7 p.m.
Women’s basketball (1–5) hosts Towson (3–2) Tuesday night following a winless trip to Cancun over Thanksgiving. The Colonials are in the midst of a four-game losing streak, but saw signs of improvement over the weekend at the Cancun Challenge despite dropping games to Georgia Tech and No. 13 NC State. Last year, in the first game of the two-year home-and-home agreement, the Colonials routed Towson on the road for their first win of the season, but both squads look very different now. Towson returns just one starter from last year’s matchup, while the Colonials return two. Longtime fans of women’s basketball will recognize a pair of coaches on the opposing squad who will return to the Smith Center – this time on the opposing bench – for the game. Towson head coach Diane Richardson was an assistant coach at GW under former head coach Jonathan Tsipis from 2012 to 2016. She spent the 2016-17 season as an assistant coach and recruiting coordinator at West Virginia before being named the head coach at Towson ahead of the 2017-18 season. Towson assistant coach Zach Kancher formerly worked under Tsipis during the 2015-16 season. GW’s greatest strength has continued to be its defense. The Colonials are averaging just 48.3 points per game, but have managed to hold opponents to 59.8 points per game. Compared to Towson’s 66.0 points conceded per game average, the Colonials’ defense will be tough for the Tigers to break. The Colonials held No. 13 NC State to 69 points Friday despite the Wolfpack averaging 75.2 points per game. The Colonials also saw an uptick in offensive output against No. 13 NC State, sinking a season-high 24 field goals while committing just five turnovers in the game. The Tigers have struggled guarding the perimeter this season – they allowed Mount St. Mary’s to sink 14 three-point shots in their 87–78 loss Saturday. The Colonials were able to make a season-high 11 three-point shots against the Wolfpack. 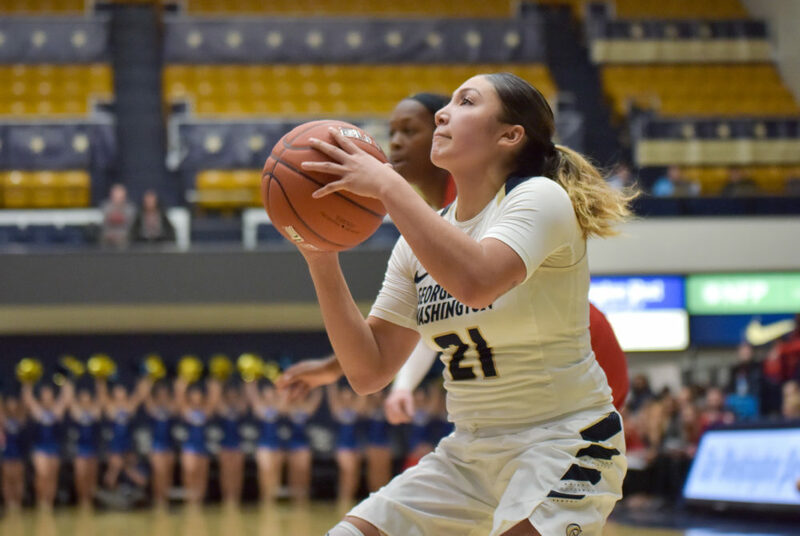 With that in mind, GW should feed the ball to the team’s sharp-shooters, senior guard Mei-Lyn Bautista and senior forward Kelsi Mahoney. The duo combine for 27 of GW’s 38-made threes on the season. As a team, GW is beating opponents at the three-point line 38–32 while Towson has made just 26 three-point shots. If the Colonials capitalize on open looks from beyond the arc, they will be able to secure serious points over Towson. Even with an increase in scoring, the Colonials will still need to step up under the glass to compete with the Tigers. Towson is especially effective in getting second-chance opportunities and has out-rebounded opponents 98–65 on the offensive glass. GW is being beat under the glass by an average of 9.3 rebounds per game, but it will need to crash the boards on both ends of the court to limit Towson’s ability to capitalize on extra possessions. Towson brings a high-scoring offense to the Smith Center, averaging 74.4 points per game, but has given up an average of 66.0 points per game as well. The Tigers are powered by redshirt sophomore guard Kionna Jeter. In her first year on the court for the Tigers, she has been an explosive scoring presence. Jeter is the seventh leading scorer in the nation, averaging 24.6 points per game, to go along with 6.4 rebounds and 3.8 steals per game. She poured in 32 points with eight rebounds, two blocks and five steals in a victory over La Salle earlier this month and led the Tigers in Towson’s loss to Mount St. Mary’s Saturday with 27 points and five rebounds. Nearly a third of Towson’s total points are coming from the guard, meaning the Tigers will rely on her to tally points in the game. If the Colonials’ backcourt can contain Jeter and force the Tigers to pass the ball on offense, they may find success. But otherwise, they may find themselves playing catch up for the entire match. Towson also employs a threat under the basket in junior forward Nukiya Mayo, who averages a team-high 6.8 rebounds per game while leading the Tigers with 17 offensive rebounds on the year. The junior is the team’s second-best scorer, averaging 11.5 points per game, making her a dual threat. The Colonials have struggled with rebounding this season, so neutralizing Mayo on second-chance opportunities will be key. But even if the Colonials are able to slow her down, Mayo and Jeter both average more rebounds than any Colonial so far this season, giving the Tigers an added advantage under the glass. The Colonials will have a tall order guarding a potent scorer like Jeter, but the rest of Towson’s roster is putting up comparable numbers to GW’s squad. Sophomore guard Jalynn Holmes rounds out Towson’s top-three scorers, nearly averaging double-digit scoring with 9.4 points and four rebounds per game. Holmes’ average would pin her as GW’s second-best scorer behind Bautista’s 11.4 points per game average, but the Colonials should be able to compete with the rest of Towson’s point production. If the Colonials are able to neutralize Jeter, box out Mayo under the rim and put up consistent three-point shooting while taking care of the ball, Tuesday’s match will be a competitive game – but GW will need to check several boxes to be in position to pick up its second win of the year.